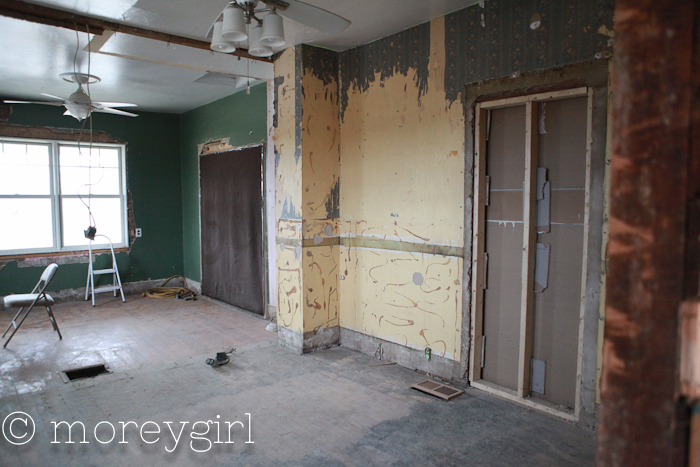 I know I haven't even shared the rest of the house with you, but I'm so flipping excited about the kitchen that I cannot wait any longer! 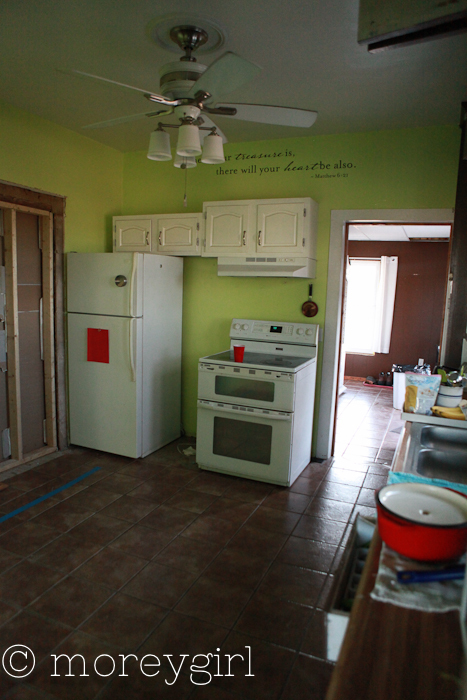 The kitchen started off as 12x12 room that had 3 door ways and one wall of cabinets. 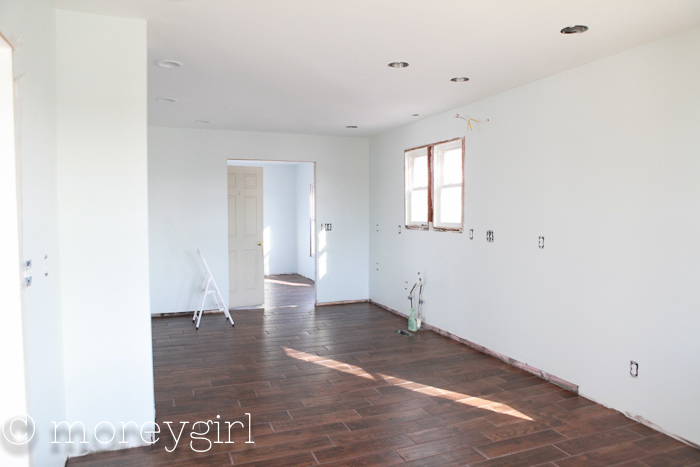 That door opening (on left of below pic) used to go through to the living room but we opened up the other door way leading in to it so we could have more room for cabinets and appliances. It was two rooms just a short while ago. The door way pictured below is the same spot the above picture was taken from. Matt and I did most of the demo. We did have lots of help from our friend Matt too. This closet was the only closet in the entire house. 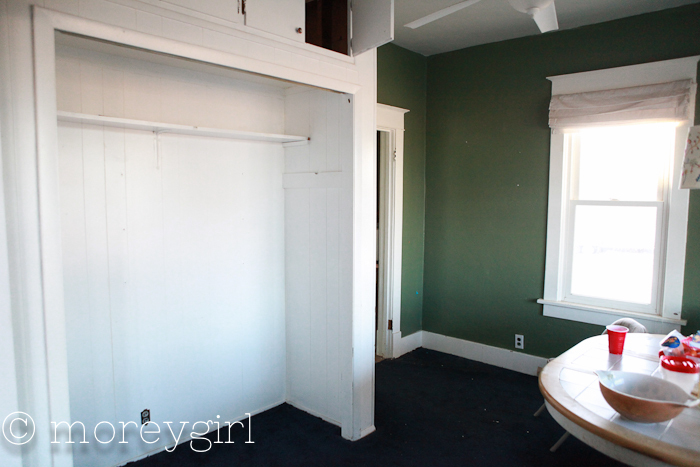 We did use this room as our bedroom when we first moved in but it was soon turned into our office since it's in the front of the house. Here's the view from the other side of the room above. That chimney there with the brick has had to stay as it's not a fireplace chimney but it does have vents for other needed things (ie the furnace) running through it. I was a little disappointed about that but we did get our hopes up when we saw the brick. But my hopes were dashed when the previous owners put plaster directly on the other sides of it. And that stuff was not coming off with out ruining the brick. There is the bigger opening into the living room. It's covered up to keep the dust and dirt out of the new side. You also get an awesome view of nasty wallpaper too! 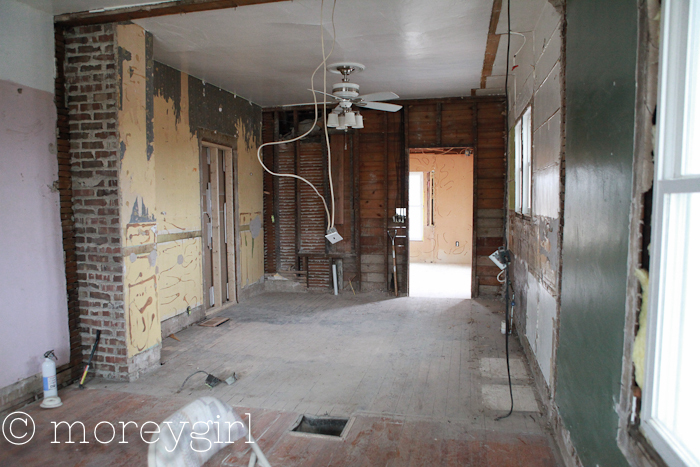 We ended up taking the plaster and lath off of all the walls and totally redrywalling the whole space. And what a difference that makes! We widened the other entry too. And installed new tile, thanks again to our friend Matt and his wife Jenn! I am so thankful for willing friends and a clean kitchen! I will have more updates and details soon! Marvelous, what a blog it is! This web site gives valuable information to us, keep it up. I’m slightly sure I will be informed many new stuff right right here! Best of luck for the next! a paid option? There are so many options out there that I’m completely overwhelmed .. Any ideas? Cheers! you made blogging glance easy. The whole look of your web site is excellent, let alone the content material! in support of his web page, for the reason that here every information is quality based information. I’m very happy to uncover this great site. I want to to thank you for your time for this fantastic read!! I definitely savored every little bit of it and I have you book marked to look at new things on your site.